The NASCAR.com Superstore is the official online store of NASCAR, providing a selection of officially licensed merchandise that can’t be beat. Whether shopping for yourself or looking for the perfect gift, the Superstore has something for everyone. 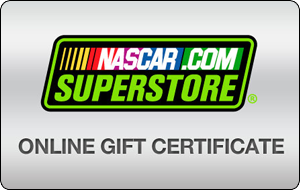 NASCAR.com Superstore Gift Cards may be redeemed online at store.nascar.com. Gift Cards are non-transferable, non-refundable and are not redeemable for cash except as required by law. When making a purchase online at store.nascar.com, you may redeem up to ten Gift Cards per order. If you have any additional questions relating to an online purchase, please contact our Customer Service Department. No sales tax is charged when buying Online Gift Certificates, however, purchases paid for with Online Gift Certificates will be charged applicable sales tax if shipped to addresses in respective states.